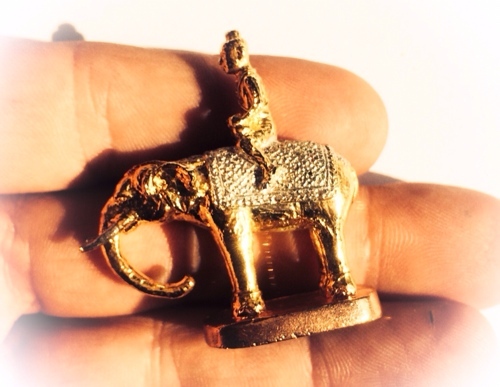 Luxuriously finished sacred elephant statuette, with a Kumarn Tong golden boy riding upon its back, made from sacred metals with 3K gold plating from master monk Pra Ajarn Supasit of Wat Bang Nam Chon temple. Pra Ajarn Supasit Is a master Gaeji Ajarn, Who is known for his immensely high-quality and small limited editions of Sacred amulets, which are so highly prized for their rarity and sacred Muan Sarn imgredients, as well as for their incredible beauty, fine design and exquisiteness of form. Who knows why it happens, but, some masters and their amulets, become so preferred by small groups of essential rarity collectors, that all their amulets become immensely valuable. Pra Ajarn Supasit is one of these masters and is currently perhaps one of the most highly regarded and collected amulet makers on the high end higher price level collectors scene. This particular amulet is an extremely finely crafted piece of miniature Buddhist/Animist Art. The statuette is made from smelted sacred brazen metals and ancient artefacts mixed with Sacred Yantra Foils, and has a filling of Muan Sarn Sacred Powders, with silver Takrut spell scrolls inserted in the base. 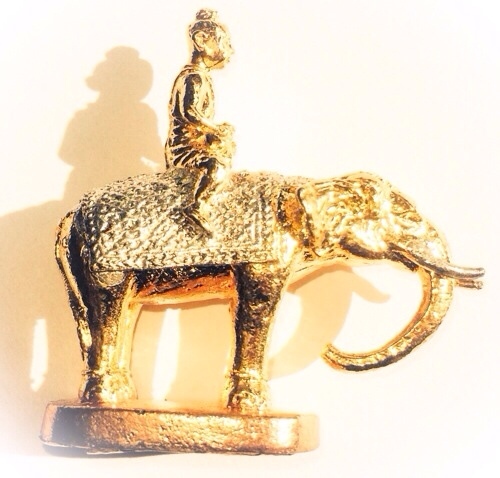 The statuette features a young boy (Kumarn Tong), with a top knot, and wearing the traditional Thai Jong Graben trousers, sitting atop of a sacred white elephant. this particular amulet/statuette, is very special for it possesses a large conglomeration of varied magical powers both protective and charming in their nature;Maha Lap, Maha Sanaeh, Metta Mahaniyom, Maha Amnaj, Kong Grapan Chadtri, Maha Pokasap, Serm Duang (improve Karma), Gae Aathan, Siang Choke. 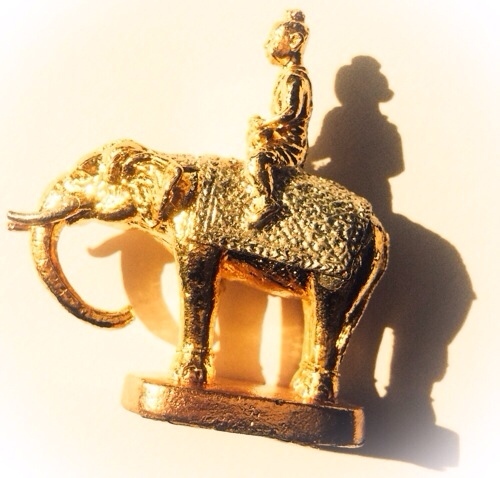 The elephant of course is not on the representative of the sacred white elephant of siam, but, is also a representative of the white elephant of the Buddhist Jataka stories; ‘Paya Chang Silawa’. this of course is what brings immense ‘Serm Duang’ power to remove bad karma and to increase the causes of future auspicious blessings and good luck and wealthy fortunes, healthy living, and long life. The Paya chang Silawa was the white elephant who lived in the forest and was a past incarnation of the Lord Buddha Sakyamuni. The amulet would be heavy to wear around the neck, but can be. 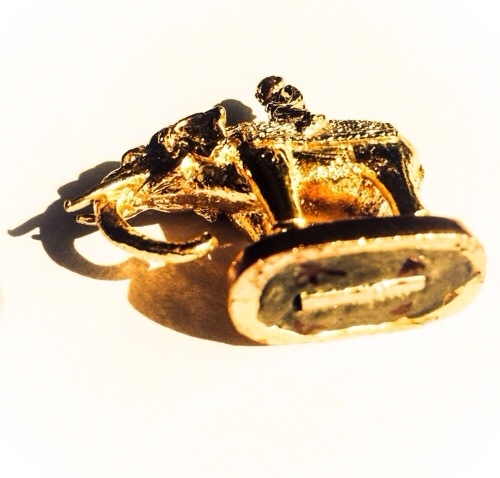 It is however, more advisable for use as a mini statuette on the altar, in your car or place of business. This elephant was met by a cold hearted hunter who was very greedy, and did not know of the word that is enough. This Hunter came back again and again,and kept asking the white elephant for more of his tusks, a d other body parts, and the white elephant just gave of himself freely, without questioning, or any resentment. Inthe end the white elephant gave everything even his own life. The unmeasurable Compassion and generosity of The white elephant and his merits is what brings great fortune and mercy charm to he who has Devotion for the merits of this great and compassionate being. The Kumarn Tong, is empowered with sacred necromantic mortal remains, which are mixed into the sacred powders stuffed within the interior of the statuette. All of the invocations of the Kata Akarn 32 were performed, to call the 32 elemental substances within the living body of a human and the three different formulas of invocation incantation and empowerment of the ‘Kata Hnun, Pluk, Riak Taat See’ for the calling turning and awakening of the four elements were performed. This was then completed as a formula, and finalised with the performing of the Nibbana Sutra, or as we say in Thai language, ‘Nippana Suudt’. Only those masters who have completed and mastered the techniques and the formulas of the Nibbana Sutra, can perform a true empowerment of the Kumarn Tong. Pra Ajarn Supasit is one of the true depth who has mastered these techniques and his Kumarn Tong and Nang Prai, and Lersi Hermit God amulets, are considered to be amongst the most powerful of this era. The only other masters who are producing such powerful Kumarn Tong in the present era, are mostly Laymasters or Lersi, and of those, also not many of them in existence. 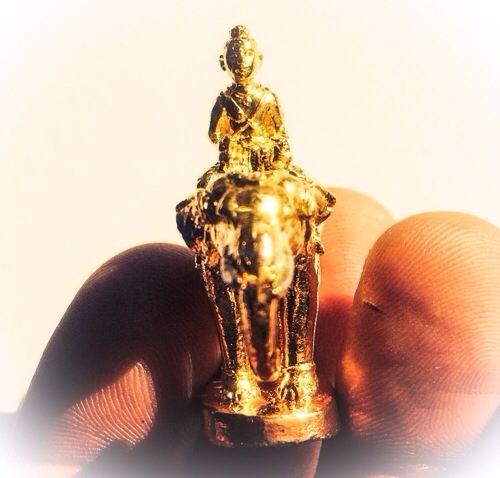 As to ordained Buddhist monks, one could say that the only comparable masters to Pra Ajarn Supasit for making powerful Kumarn Tong and other similar necromantic amulets are Luang Por Dam of Wat Pra Puttabat, and Luang Por Kane, of Wat Koh Phu, who’s are also becoming almost as legendary as the Kumarn Tong from the worlds most famous maker, the long deceased Luang Por Te of Wat Sam Ngam. We focus on trying to stock amulets from all three of these masters, for their true and great power and authentic magical amulets. Few masters indeed can come close to the power of these three masters, who are three of our most preferred masters and most definitely our three most preferred masters for this particular kind of amulet. (Can be used for Rak Yom, Kumarn Tong, Prai Faed, Prai Tong). 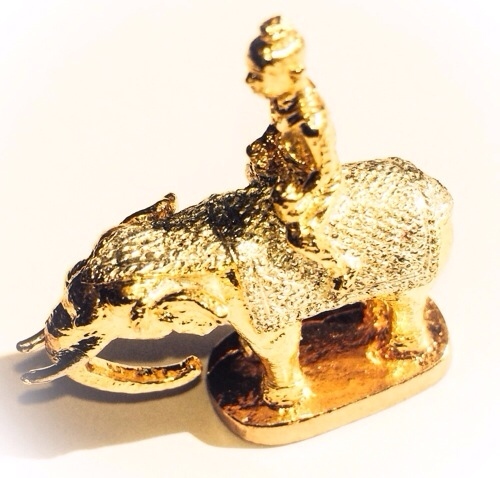 This is in our opinion, an absolutely pristinely made amulet of the finest quality, and the most auspicious blessings possible, especially when one considers the attributed meanings of the sacred white elephant, and what blessings it can bring. Om Sri Paya Chang Silawa, Khor Choke Laap Maha Amnaj Kong Grapan Chadtri Klaew Klaad maha Pokasap Metta Mahaniyom Aehi Jidtang Bpiyamg Ma Ma Silawaa Swaa Ha.